BAGHOUZ, Syria (AP) — The collection of tents was largely silent on a sunny winter Monday afternoon. Few people were visible, but the few out and about were calm: Two men in long robes and pants walked slowly together through the grass, a woman leisurely came out of her tent to look around, a man on a motorcycle drove toward the river. At one point, gunfire crackled in the distance. An SDF commander on the roof with a number of fighters said it isn’t always so quiet. Only days earlier the militants surprised the soldiers with an attempted night raid. 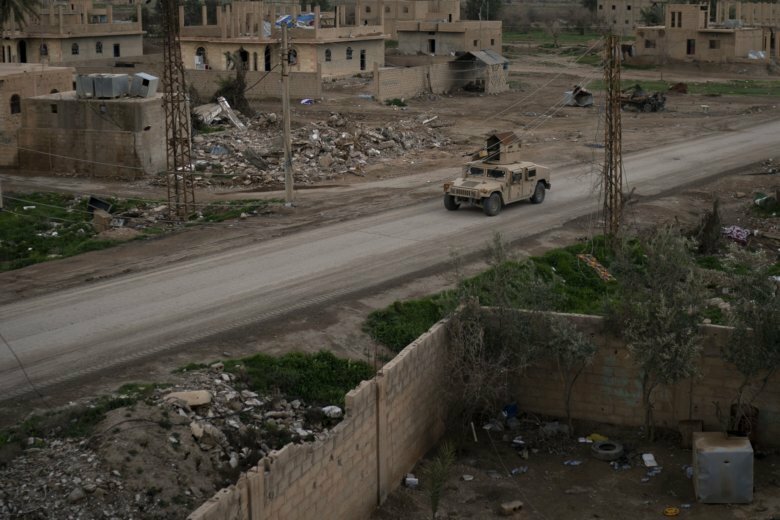 The SDF can’t assault the site or call in airstrikes because of the civilians, he said, adding that his fighters have seen the militants moving civilians around at gunpoint as protection. “They try a psychological war. But that is it! The war is over, and we won,” said the commander, who spoke on condition he be identified only by his nom de guerre, Baran, in line with SDF rules. The SDF appears to be aiming to wait the militants out. “They don’t have supplies in the area they are in that would last for a week or more,” said Baran, the commander. Over 30,000 people who left the last IS-held areas have arrived at the al-Hol camp in Syria’s northern Hassakeh province in the last few weeks, raising the overall population of the camp to almost 42,000. Scattered in the dirt outside the building were various items left behind. The ID cards of two men from Aleppo province, including a 30-year old father of a 3-year-old; a teddy bear; and not far away a torn copy of “Milestones on the Road,” a seminal book from the 1960s by Egyptian radical Islamic Sayyid Qutb that has been a major influence on jihadi groups around the world.